"This is an adapted family recipe. It is a lot of work, but worth the effort. 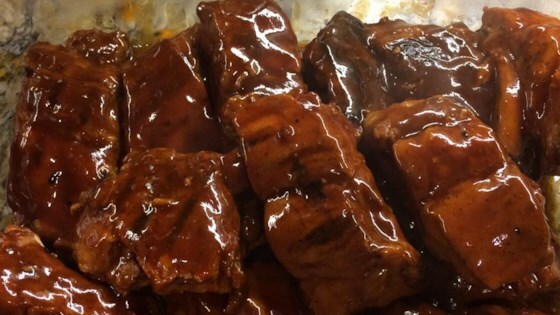 If you do not have a slow cooker, you can bake the ribs for 2 to 3 hours, covered, in the oven." Cut ribs into small portions of 2 or 3 bones each. Bring a large pot of water to a boil. Season water a pinch each of salt, black pepper, and crushed red pepper to the water. Boil ribs in seasoned water for 20 minutes. Drain, and let the ribs sit for about a half an hour. Lightly coat the ribs with barbecue sauce. Cook the ribs over high heat for a 5 to 10 minutes on each side to get a nice grilled look to them. Place grilled ribs in a slow cooker. Pour remaining barbecue sauce and one bottle of beer over the ribs; this should cover at least half of the ribs. Cover, and cook on High for 3 hours. Check ribs every hour or so, and add more beer if needed to dilute sauce. Stir to get the ribs on top into the sauce. The ribs are done when the meat is falling off the bone. The ribs were cooked completely in the first process, the rest is about flavor and texture. If you add too much beer, the sauce will get very thin. It is best to drink most of the second bottle of beer. Great ribs, couldn't grill them, but put them in a covered pan at 325 for 3 hours. Made the best ribs I ever tasted, with or without the beer.